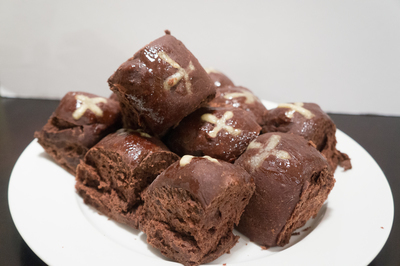 Easter is the perfect time to over indulge in hot cross buns but we should be able to enjoy them any time of year! 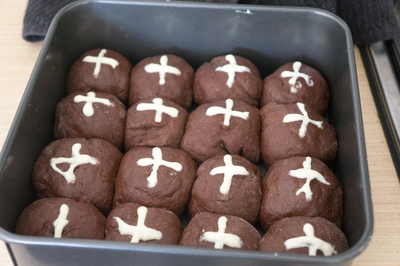 These chocolate hot cross buns are delicious and so soft! 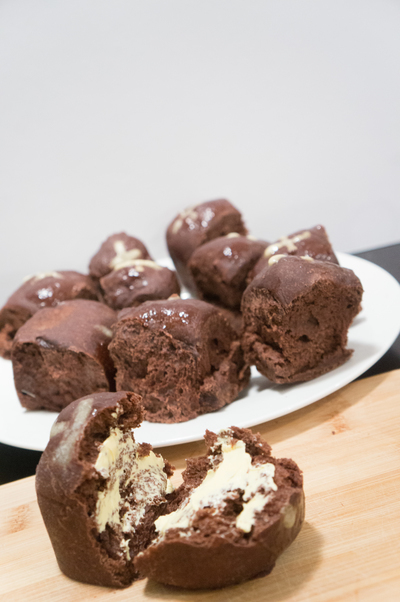 They taste exactly like the traditional bun but with a chocolate hit. Perfect served slightly warm and if you desire you can serve it with lashings of butter. Sift flour, cocoa powder, sugar, yeast, mixed spice and salt in to a large bowl. In a separate bowl, whisk together milk, butter and egg. 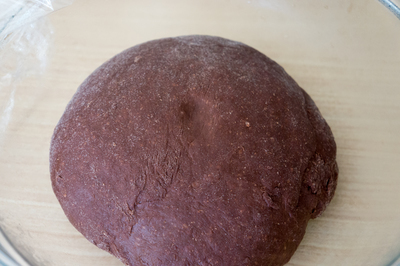 Make a well in the centre of the flour mixture and gradually add milk mixture until dough comes together. Turn dough out on to lightly floured surface and knead for 10 minutes until soft and smooth. Return dough to a bowl and cover with plastic wrap followed by a clean tea towel. Put bowl in a warm, draught-free area for one hour or until dough doubles in size. Preheat oven to 180 C and grease and line a square bake tin (about 23 cm) with baking paper. Scrape the dough from the bowl onto a floured surface. Divide dough in to 16 even sized balls. Arrange side by side in the prepared tin. Set aside again in a warm place for 30 minutes or until dough has risen to the top of the tin. Combine extra flour and 1/4 cup of water in a bowl to form a smooth paste (you may need to add more water here). Place paste in a piping bag and pipe crosses on to dough, (you can also just a plastic bag and just snip the corner off). Bake for 25 minutes or until cooked. Stand for 10 minutes in tin before turning out on to wire rack. Brush warm buns with apricot jam and serve.